I’ve been traveling a lot for work this fall and thinking about travel and the things we do to remove movement from our lives. If you can’t walk or can’t run, I get that. These days that’s me, the running post anyway. But what I fail to understand is the penchant for those of us who can walk, who can run, and who can lift things to make our lives as easy as possible. So easy in fact that then we have to seek out hard, punishing workouts to make up for all that ease. I am often struck by this in airports, the land of moving sidewalks and escalators and people with wheelie suitcases. Again, if you need the escalator and the elevator and the wheelie suitcase, I’m happy these things are available . But the rest of us? Here’s my usual bags for traveling. 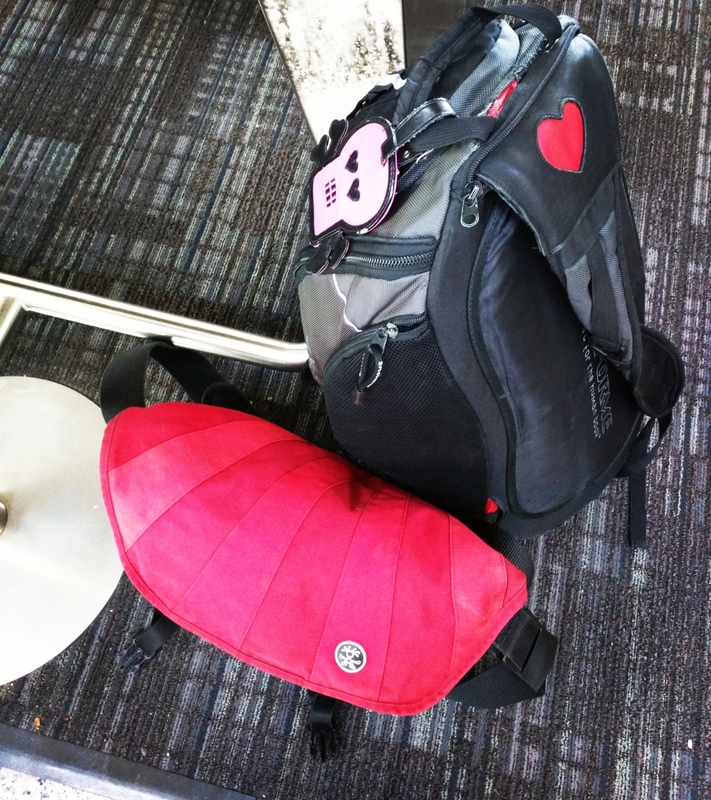 When my knee was at its worst I bought a small bright pink wheelie suitcase. But I’m still hoping that’s a temporary measure. Now this message–add movement to your life– can come across sounding judgemental and shame-y but I want to suggest another way of looking at it. The recent report on American physical activity guidelines makes it clear that all movement counts. It doesn’t need to be a planned workout or an hour at the gym. Movement can look like taking the stairs instead of the elevator or walking to see a coworker rather than phoning or emailing them. There’s a tendency to be all or nothing about fitness. Either I get up and do an hour-long CrossFit workout or I drive to work at sit at my desk and do nothing at all. But it doesn’t have to be that way. On recent work travel days I was often able to get in lots of active minutes even without finding a gym or having a bike to take with me. Google Fit has been useful that way since it tracks active minutes and adds them all up. There’s a big difference between days of almost zero movement and days with lots even on days that don’t have a formal workout built in. Yes to this! Just about everything in life is not all-or-nothing. Movement is a prime example. I can’t tell you how many times I’ve speed-walked, trudged, or strolled through an airport with my bags, knowing that it was one of the few chances I’d get to move around at will that day. Thanks for reminding us– it’s especially important for me to remember this during the holidays. I used to be annoyed that my mother made us take the stairs instead of elevators–and now, of course, I do it myself!